Always check the simple, stupid stuff first. Check that the kill switch is in the correct position. Check that the battery is charged. Check that there’s gas in the tank and the petcock is running. It’s no fun to tear into a bike just to realize your kill switch was off. Always check the easy solutions first. Assuming the old motorcycle you’ve purchased is fairly complete or in some sort of running condition, it’s a good idea to start your rebuild/restoration with a full tune up as per the manufacturer’s shop manual. You’ll need to refer to your motorcycle’s shop manual for the specific tune up procedures for your specific make and model, but these general procedures apply to most old motorcycles. First thing to do is to completely drain and change the oil. Unscrew the oil drain plug with an oil catch pan underneath the bike. Recommended for older bikes (may include zinc additives that are not present in many modern synthetic blends). Note any abnormal or large debris that come out with the oil – this could be indicative of bigger problems inside the engine and you may not want to try to start it. Remove the oil filter and do the same inspection. Remove your motorcycle spark plugs.Inspect their color and condition – if there’s a lot of carbon build up, you can try to clean them. Replace them if they look past repair. With a plug gap checker or feeler gauges, measure the gap between the center tip and the electrode. If there is room between the contacts at the proper measurement, the plug gap is too big. Refer to your service manual for specific procedures and measurements. Unscrew the points or ignition cover. Carefully turn the engine on the larger nut near the timing advance with the proper sized wrench until cylinders 1-4 reach top dead center. Set the cam chain tensioner as per instructions in your manual. Remove the engine cover of the valve tappet covers to make your measurements under the camshaft lobes. With the engine at TDC for cylinders 1-4, take the measurements with your feeler gauge on the intake and exhaust valves that are not compressed down. For overhead cams with rocker arms, make adjustments as necessary and turn the engine until you reach the same T mark and repeat your measurements on the other cylinder. Repeat the process for the timing mark on cylinders 2-3. If your motorcycle has shim under bucket type valves, you’ll need to remove the camshafts to put the proper size shims in there. Remove the points plate cover. Refer to your motorcycle’s shop manual for specific points gaps. Carefully turn the engine with a wrench on the larger nut near the timing advance until the points close and begin to open again. At the point when your points have reached their widest position, place the proper size feeler gauge between them. If the points gap is out of the range specified in your manual, adjust as necessary. Warm up your motorcycle to operating temperature so that it idles normally. Connect the timing light clamp to the #4 spark plug wire and the power cable to the your battery and a ground. Loosen your points plate enough so that you can make adjustments if necessary. Aim your timing light at the hole in the points plate to check that the 1-4 F mark lines up with the timing mark on the engine case. If the F mark falls to the left of the timing mark, light tap your points plate clockwise. If the F mark falls to the right of the timing mark, lightly tap your plate counter-clockwise. If the F mark lines up with the timing mark at idle, bring up the engine RPMs to check the spark advance. Here the two parallel advance marks on your points plate should appear with the timing mark on the case. Once timing on 1-4 is set, tighten the points plate screws and connect your timing light to #3 plug wire to repeat the process for 2-3. Make sure the 2-3 plate is loose enough so you can move it, but tight enough that it stays in place. Next up, you should check that your gas tank petcock and the carb needle valves are working properly to ensure fuel is filling the carb bowls. Replace any old fuel in the gas tank with fresh gas. Drain any old fuel from your carb bowls. Place a clear hose on the drain tube on one of your carbs, unscrew the drain plug holding the end of the hose above the body of the float bowl. Turn on your motorcycle petcock so that fuel begins to flow. Watch the clear hose to see that fuel is filling the bowl. (Mark or measure where it falls relative to the carb body in case you need to adjust the float height). Repeat for the other carbs. If none of the bowls are filling, first check that the petcock is operating. If only some of the bowls are filling or are filling partially, you may need to fully breakdown and clean your carburetors before proceeding. For bikes that have been sitting for a very long time, it’s wise to carefully clean the carbs anyway. With all of the above complete, you can fire up your classic motorcycle to evaluate how it runs after its initial tune up. At this point a carb sync is likely in order. What to do if Your Old Motorcycle Won’t Start? Check for fuel, air/compression, and spark! Your motorcycle only needs three simple things to fire – fuel, air (compression), and a spark. These 3 tests below will help you get started on the right track to diagnose why your old motorcycle isn’t starting. Install your compression tester to the cylinder you want to start on. Kick the starter or use the electric starter to turn the engine over a few times. Record the PSI reading on the compression tester. Repeat a few times in the same cylinder to get a few readings that are the same. Repeat for the other cylinders. Refer to your service manual for the correct compression ranges. If they’re too low, add about a teaspoon of motor oil in through the spark plug holes and repeat the test. If compression readings improve, you’ll need to at least replace your piston rings and hone your cylinders. When compression readings don’t improve, confirm your valve clearances are correct and test again. If compression is still too low, you’ll need to service your valves. 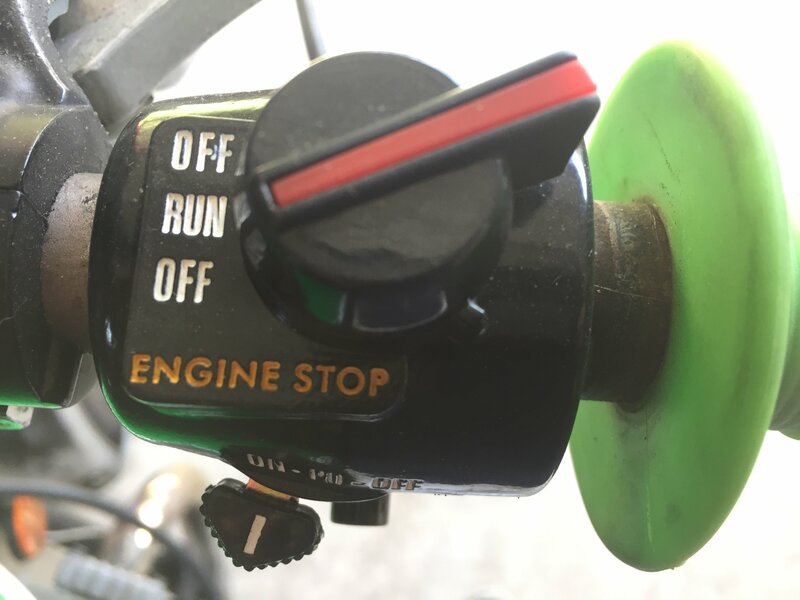 If you don’t have access to a compression tester, you can do a quick check by placing your thumb over the spark plug hole (with all plugs removed) and turning the engine over. With proper compression in the cylinders, you should not be able to keep your thumb over the hole. Removing a spark plug and placing it on the cylinder block. Watch for a strong blue spark at the tip of the spark plug. If it fails to spark, confirm power is getting to your coils and check your ignition system. When it won’t start, remove your spark plugs to check if they are wet with gas or smell like gas. If yes, fuel is getting to your cylinders. If no, continue checking. Confirm fuel is filling your carb bowls. If not, check that fuel is flowing through the petcock. If it is, your carbs needs a cleaning and possibly a rebuild. If fuel is filling the bowls but not getting to your cylinders, your jets may be clogged and likely need a cleaning. That’s all there is to it – if you’re motorcycle is not starting, it’s got to be at least one of those issues above. If it’s more than one, good thing you were planning on rebuilding it anyway, right? Listed here are the mileage and service items that should typically be performed on vintage Japanese motorcycles. If you’ve just rebuilt the motorcycle, it’s a good idea to think of performing service and maintenance as if just came off the assembly line. Refer to your specific make and model’s shop manual for exact service items and maintenance schedules. Regular maintenance and inspection will ensure that your vintage motorcycle rebuild stays on the road longer and remains safe to ride.